Benno Carl Crede (also: Carl Benno Crede; 1847-1929) was Carl Siegmund Franz Crede's son [70-72]. Despite his christian name Benno, he also appears under the name Carl Crede in the literature. Crede studied medicine and specialized as a surgeon in Dresden, Germany, thereafter. Scientifically, Crede followed the steps of his father in so far as performing research activities on silver in colloidal form, which he introduced into medical practice in 1897. This was possible by collaboration with the company "Chemische Fabrik von Heyden", and led to the development of the "Collargolum Crede" ("Collargol") [73, 74] for systemic, parenteral therapy. Thus, it should be highlighted that the "Collargolum Crede" goes back to Benno Carl Crede and not to his father, Carl Siegmund Franz Crede. Wrong information concerning Crede is deriving from the internet, which is found in the biography of Otto Spiegelberg : "After the closing of the Monatsschrift für Geburtshilfe und Frauenkrankheiten (appeared 1853-1869) Spiegelberg and Carl Benno Crede (1847-1929) in 1870 founded the Archiv für Gynäkologie, of which almost every volume contained a contribution of his". Actually, the editors of the "Archiv für Gynäkologie" were "(Otto) Spiegelberg" and "Credé", in this case Carl Siegmund Franz Credé and not his son, Benno Carl Credé. Carl Crede (Carl Crede-Hoerder; 1878-1952) [76, 77], a physician, had an uncle - who was also a physician - with the name Dr. Hoerder. 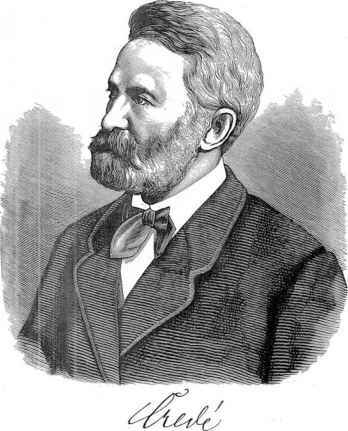 Later on Carl Crede incidentially took over the name Carl Crede-Hoerder. He further used his synonym "Credo". He was politically extremely active and a co-founder of the "Verein sozialistischer Ärzte" (Association of physicians following socialists' ideology). In his position as physician he specialized in gynecology and obstetrics. Due to his political activities, Crede spent several years in prison, following the (unjustified?) accusation of violation of the German law concerning abortion (§218 StGB; Germany). In 1913, he published a scientifically less significant paper on "Die Augeneiterung der Neugeborenen, Pathologie, Therapie und Prophylaxe"  (Ophthalmia neonatorum, etiology, pathology, therapy and prophylaxis). In the present author's estimation, the motivation for this publication was to be brought together with the ideas of Carl Sigmund Franz Crede, possibly to cause confusion. If or how Crede was related to Carl Siegmund Franz Crede remains historically unclear. I would like to express my thanks for assistance especially to the staff of the "ZB MED/Deutsche Zentralbibliothek für Medizin" (The German National Library of Medicine) in Cologne, Germany.